Brazil is home of a diverse wildlife, natural environments and extensive natural resources. It is known as the lung of the world. 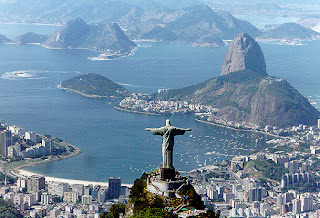 Brazil is the fifth largest country of the world and the only Portuguese-speaking country in the Americas. The magnificent Amazon Rainforest is located in this country and the Amazon River as well, which is the second longest river in the world. Brazil is also known for its football. The nation is ranked among the best football countries by FIFA with five World Cup wins. The country will be home of the 2014 FIFA World Cup and the 2016 Summer Olympics. Since 2006, a new organization have been sending representatives to the world's greatest beauty contest giving the importance that Miss World deserves in Brazil by sending winners instead of runners-up every year. Three of their last four representatives had made the semifinals of Miss World and this year Kamilla Ghabrise Rodrigues Salgado will try to bring the second crown to her nation after 39 years. TimesOfBeauty.com proudly presents Miss Mundo Brasil 2010 in an exclusive interview for our series Meet the Misses. My name is Kamilla Ghabrise Rodrigues Salgado, I am 23 years old, graduated in Business Administration at the Federal University of Para. I am currently attending on MBA in Business Management. I'm a businesswoman and manage my family’s handicraft business. I always liked to take part in beauty contests. However, just after being elected "Queen of Queens" in the largest beauty pageant and carnival costume in my region, is that greatest opportunities began to emerge for me and increased the dream of becoming a miss, along with my determination. With approximately 190 million inhabitants, Brazil has the fifth largest land area of the planet and the fifth largest population in the world. It is the only Portuguese speaking country in the Americas, in addition of being one of the most multicultural and ethnically diverse nations in the world, as a result of strong immigration from many countries. It is a country of contrasts. When someone says something about Brazil, it is easy to think about the carnival, beautiful women, fantastic beaches, soccer championships...That's pretty right! But, as well, Brazil, certainly, has so much more to offer! It has one of the greatest natural wealth of the world. Economically, has one of the world's fastest-growing major economies. Beyond all of this, warm people, great cities with everything- from slums to high technology- a wide range of weather patterns, an awesome mixture of cultures and races - and much, much more! By mentioning the natural beauties of my country, I must emphasize the pride I have of our awesome Amazon rainforest. And it was right there in Belém, the capital of Pará, state located in the heart of the Amazon, that I was born. Rich in history, culture, smells, tastes and nature and under the tropical climate, my hometown is a land of mystery and beauty. Besides the personal satisfaction for being considered the most beautiful woman in Brazil, being the first woman from Pará to represent my country in a competition as important and respected as the Miss World is a great honor for me. So, being Miss Brazil 2010 is an immeasurable joy. My intense preparation has begun earlier this year. Greater care with my feeding was essential, plus a daily workout routine, beauty treatments and studies to improve my English, besides the effort of always being updated about worldwide events, which are being strengthened further to the Miss World final. If I have to describe my personality in one word, this would be "determinação" - in English “determination”- because whenever I decide to face any challenge, I do everything in my power to achieve my goals, even if it means staying away from people I love, leaving eating some tasty treats or working out the triple as the usual. I imagine myself being a well-succeeded businesswoman, a lovely mother and married to the love of my life. I would prefer being beautiful and smart, so then I could be well succeeded with my own efforts, working hard to reach any ambitions I have. Mrs.Zilda Arns. She was one of the greatest examples of solidarity and love of others in Brazil, known worldwide for the social changes that her social projects caused. Zilda Arns Neumann was a Brazilian pediatrician and sanitarian. She founded the “Pastoral da Criança” (“Children's Pastoral”), an institution that develops actions in health, nutrition, education, citizenship and ecumenical spirituality in poor communities, aiming to save poor children from infant mortality, malnutrition and violence in their family and community context. Understanding that education has proved to be the best way to combat the most easily preventable diseases and marginalization of children, to optimize this action, she has developed her own methodology of increasing knowledge and solidarity among the poorest families. On January 12th, 2010, Zilda Arns was in Haiti on a humanitarian mission, to install there the facilities of Children's Pastoral. In that day, the country was hit by one of the most violent earthquakes in world's history. Mrs. Arns was one of the victims of this terrible disaster. I confess that I have a hidden passion for Europe. If I had to choose another country to live, it would certainly be there, maybe in France or Italy, to learn a new language and something about a different culture. But I would live there for awhile and then I would go back to Brazil. I love my country and that's where I want to live forever! The biggest problem facing the world today is the environmental issue. The man is destroying the nature and it came to a point so critical that if serious measures are not taken in an international scope, the future of the species, including the human species, will be compromised. It is necessary we respect and take the sustainable development policy very serious. It supports a fair distribution of wealth between countries, since the issue of nature conservation integrates a global perspective, both from the effects of degradation and its connection to the dynamics in the international market. The protection of the environment should occur so that the economy will develop, within the limits of respect for nature. The sustainable use of natural resources helps in achieving social equality. It is based on changing the values of society, focusing on quality of life and social welfare. This way, we will guarantee to the future generations the access to the natural resources that enable us to live. I believe that the beauty queen should always try to answer in order to not disappoint those who are listening, but without hiding her own truth. Therefore, it is necessary to be politically correct, but being true is part of it. Firstly, I hope I can be elected Miss World 2010, if it’s God will. I also think I’m going to meet amazing girls, an excellent staff, and find out an awesome country and a fantastic place. I look forward to have an unique and wonderful experience. I admire all the former winners of Miss World. All of them are victorious women, who fought for their objectives and achieved it. The influence power of beauty can be used positively as an engine for social actions and/or environmental, exactly the way this pageant aims to. This is magnificent. And far from being a cliche, to help these causes is absolutely satisfactory. The experience I had to participate, and have earned "Beauty with a Purpose" award in the national phase of the competition, with which I could raise a significant amount of money to benefit the charity institution I embrace, was a great motivator for me and made me feel deeply rewarded. Thanks very much for the cheering and for all the support. I promise I’ll do my best in order to well represent my country and, who knows, to win the Miss World 2010.